Even if you don't agree with aspects of an author's work, as I did recently with The Language of Websites by Mark Boardman (Routledge, 2005), you can appreciate how scholarly activity fosters the preservation and circulation of digital ephemera. 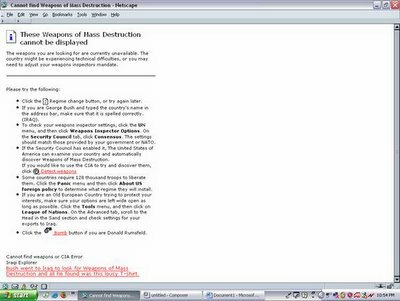 For example, I found an image of this webpage in Boardman's book, which I appreciated both for its subversive political content and the creator's attention to highly specific web conventions. (Click on image to enlarge.) 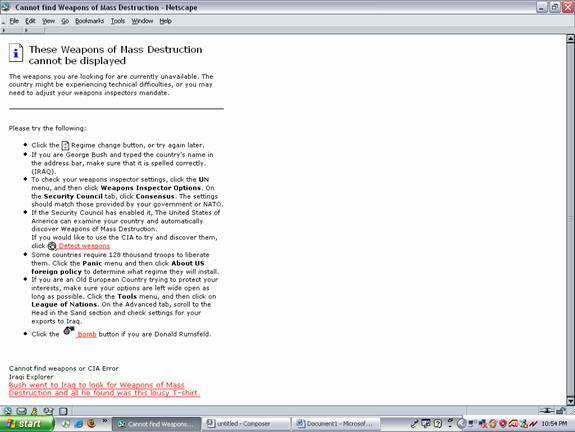 This parody error page that reads "These Weapons of Mass Destruction cannot be displayed" plays with form and content in a number of ways by turning a failed search into what seems to a starting point for research, although the links that are followed lead only to cues for consumption on Amazon.com. I admire the fact that Boardman's book close reads web pages for their typographical, syntactical, and metadata features. What's valuable about the book for me is his discussion of web genres, but it's also where I took issue with overly broad generalizations that immediately suggested multiple counterexamples. In particular, Boardman suggests that "institutional websites" are less significant to critics, because personal websites are where the "real publishing revolution has come." Boardman claims that institutional sites are more like traditional print media, because the institution has the legitimating power to wield corporate authorship and thus publish only approved and internally consistent versions of text. This may be generally true, but it is an oversimplification, given the complexity and density of many institutional sites. There is plenty of subversive content on institutional websites: one can find everything from Bertolt Brecht poems to Al Jazeera transcripts on URL's from the federal government. Furthermore, based on my own research, I would argue that institutions are characterized by ideological tensions and battles between competing stakeholders: that's what makes them of interest to me as a rhetorician. Websites are expected to do a lot more than simply provide PR for an institution: they provide reports, speeches, hearings, open letters, and even certain statistics that are mandated by law to be disclosed. Even when authorship of a policy document appears to be masked by an anonymous collective of bureaucracy, embedded code can contain information about rhetorical and compositional history. For example, Frank Rich of the New York Times recently wrote in "It Takes a Potemkin Village" that a few keystrokes worked upon the original National Strategy for Victory in Iraq PDF that was released by the White House indicated who the real author was: "Peter Feaver, a Duke political scientist," whose specialty is public opinion not nation building. There are more problems with Boardman's book than his summary dismissal of the vibrancy of these venues for public rhetoric. With the advent of gaming and other participatory web applications, I would say that digital media do more than simply exist in relation to print media, which is where Boardman largely keeps it. And by often looking at webtexts without historical and rhetorical contexts, I think Boardman is missing a fundamental paradigm shift, one that I have characterized as a move from knowledge culture to information culture. Lastly, books about the World Wide Web are invariably dated by the time that they are published, so I can't complain about the antiquated material on search engines or the integration of audio and video. But Boardman also uses a very outmoded "website as building" analogy in his chapter on institutional websites that has long ago been exploded even by its former proponents, such as architectural critic William J. Mitchell. That said, there is a lot to like about this book as well. Boardman's material on domain name branding, which I can understand as a member of "uci," is useful. He also connects the accepted taxonomy of blog subgenres to particular linguistic markers in original ways. Finally, the end-of-chapter extension activities and the chapter on writing for the web show an admirable pedagogical orientation and how the work should be judged more leniently as a blended genre: part textbook and part scholarly monograph. The point about ephemera is really important. I am starting to save text from news articles into Word docs because I know that those links might disappear by the time I get around to writing about design in print. But saving whole pages is even more important if your topic is visual rhetoric on the web. On the topic of institutional vs. personal sites: my sister Ellen and I are using the phrase "independent" web sites (on the model of "indie" films) to define the genre of the site developed by individuals with institutional affiliations (largely to universities) who nonetheless want their own URL. Although it costs more, the address is "yours" and so is the content and the liability. The point about archiving pages is really important. The internet makes other forms of ephemera (napkins, matchbooks, playbills) seem -- well, quite permanent. I was also interested about the debate concerning institutional vs. individual websites. My sister Ellen and I are using the term "independent web site" (on the model of "indie films") to talk about why people with institutional opportunities (universities) might want to get their own URL, rent server space, etc. Thanks for your review of my book. I appreciate the time you have taken to comment on it in detail. Sorry for the time delay, but I've only just seen your post. You make the point that you think I have over-simplified the ways in which institutional websites work, and failed to reflect websites that represent competing agendas within the institution. I accept that a more detailed study of institutional websites would definitely reveal these tensions; but the comments I made related only to the default presence of the institution and maybe one or two links away from that default presence, into the rest of the site. I still think that these pages would almost always convey a very consistent corporate identity, and that you would have to dig a lot deeper to uncover any kind of tension or subversion. Given a more liberal word limit for the book, I would love to have uncovered and explored these tensions, but I was unable to go above 30,000 words for the whole book. As far the websites as buildings metaphor being "outmoded" is concerned, I wasn't really trying to be original or fashionable – just to give students a way of visualising hyperlink structure in a less than abstract way. It's the second Unit in the book, and as such was intended to give a basic but workable introduction to some of the linguistic features of websites – for students who would need an accessible metaphor to at least get them started on close linguistic analysis of a medium that they would not be used to looking at in that way. The other main criticism you make is that I locate web texts in relation to print media and pretty much leave them there, without historical or rhetorical contextualisation. Web texts – especially early ones, which the book deliberately dwells on to a certain extent – are always going to retain an atavistic relation to print. But of course they have become something else. Again, to reflect the full, complex nature of this evolution would have been fascinating but outside the scope of the book.